Come along to the beautiful Lake Theatre to share this experience, with Lake Moogerah and the Scenic Rim as the backdrop. 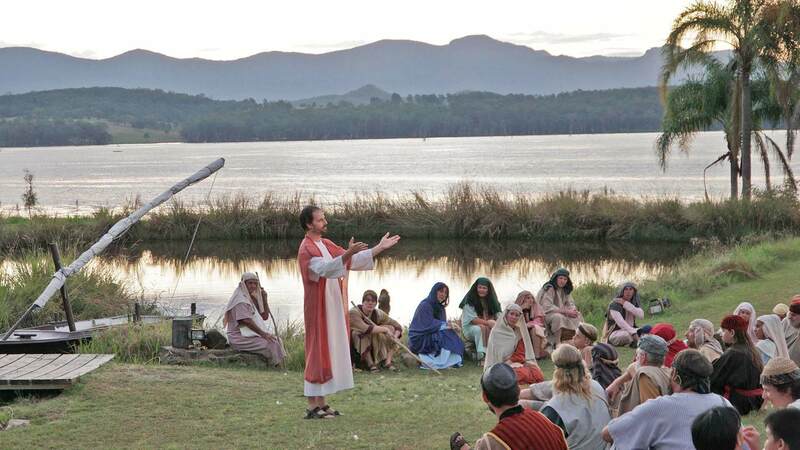 There are 4 performances of the Moogerah Passion Play each year. The first 2 performances are on the Saturday and Sunday of the weekend before Easter. The Sunday of that weekend is known as Palm Sunday. The last 2 performances are on Good Friday and Easter Saturday. The table at https://en.wikipedia.org/wiki/List_of_dates_for_Easter will help you work out when Easter is in a future year so you can work out performance dates for that year. Our performance venue is known as the Lake Theatre. For more information about the Lake Theatre, click here. Up to 100 people of all ages (from 3 to around 83) are involved either as cast or crew. Rehearsals start in mid to late January. Previous acting experience is not essential. Anyone who wants to be can be part of the cast. Contact us if interested.